The world premiere of sweet salty Lao took place on November 22 during IDFA 2009. The documentary was selected in the category ‘Premieres from the Lowlands’ and therefore competed for the ‘Dioraphte IDFA Award for Dutch Documentary’ and the ‘IDFA Audience Award’. In 2010 sweet salty Lao was selected for the Debute Competition of the 30th Nederlands Film Festival. The duration is 45 minutes. Sweet salty Lao is the poetic account of a working day in the salt mining village of Ban Nateuy in Laos. The camera tells the story; long shots and static picturesque images draw the viewer into the colourful poetry of this village industry in Laos. 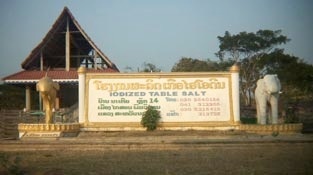 Salt is the basis of life in Ban Nateuy. A rich source of security, a risky monoculture, an age old balance. The film is a combination of colourful melancholy, hard reality and the daily grind of economic subsistence. Beneath the surface, the pace of change makes itself felt. The foreman has a table, a telephone and a file with papers. The ringing tones of the first mobile phone together with the sound of a truck’s engine are the only mechanical sounds announcing the arrival of the modern age. Sweet salty Lao is a serene documentary made by Thijs Dikshoorn and Hélène Kocken. Thijs Dikshoorn is a motion graphics designer. He has made many animations, short films and projections for museums and (broadcasting) companies. Hélène Kocken is an artist. She makes video installations and short experimental films. They financed the documentary themselves using the minimum of camera equipment and having no previous experience in making documentaries. Sweet salty Lao is their first collaboration under the name T&H Films. The rich visual imagery, painstaking editing and sensitive use of real life sound recording create an affectionate portrait of ‘life as it is’ in Ban Nateuy. The makers of the documentary lived in the village for a period in order to be able to record the intimacies of daily life. January 2010 they returned to the village in order to give the people their own premiere.